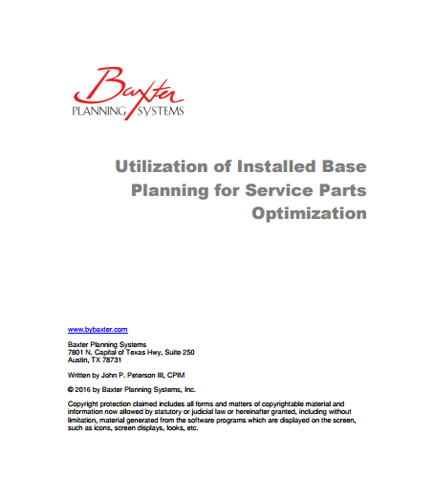 "Installed Base Planning for Better Service Parts Optimization"
How is Installed Base Planning helping organization to optimize inventory along with better Service Parts Optimization ? Is it optimizing inventory by improving forecasts and generating more intelligent target stock levels in low and no demand environments common to services parts planning operations? -What is Installed Base Planning? -How can you meet the supply chain goals using service parts optimization with Installed Base Planning? -Where to stock service inventory to support an installed base data management? -How to use Installed Base data to calculate the forecast? -What is the proper target stock level for each part at each location to support the forecasted demand? What is Service Contract ?